What kind of country do you want to live in? That’s one of the questions posed in a fascinating, in-depth series airing on PBS right now. 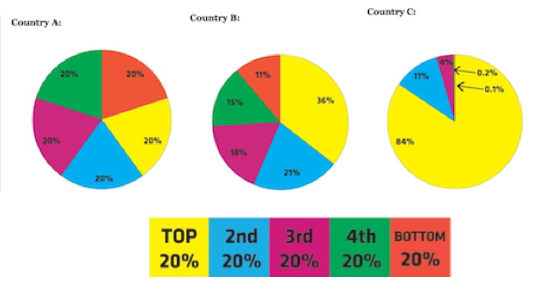 They started with a pie chart (reproduced below), which shows distribution of wealth in three countries. You can go here to take the quiz, guessing which pie chart represents which country, including the United States. Spoiler alert: If you want to take the poll without knowing the answer, go there before reading further! And then there’s the second question: which country would you want to live in? In the academic study that preceded the PBS series, 92 percent of the people surveyed wanted to live in “Country B,” where wealth is sort of, but not quite, evenly distributed, rather than “Country C,” where the richest 20 percent of the people own a whopping 84 percent of the wealth. Where, in fact, the richest one percent of the people own more than a third of the country’s wealth.Country C — that would be us. From In Class Warfare, Guess Which Class is Winning“There’s class warfare, all right,” Mr. Buffett said, “but it’s my class, the rich class, that’s making war, and we’re winning. Income inequality is not quite as stark as the inequality in wealth, but it’s still pretty dramatic, as I noted in a recent blog post. According to the Census figures, in 2009, 14.3 percent of all people in the United States were living in poverty. That’s bad enough, but if you’re a kid, the numbers get worse. The Children’s Defense Fund released its annual Kids Count report on August 17. Across the country, 20 percent of kids were living in poverty. That’s an increase of 18 percent over the past ten years. The Minnesota Children’s Defense Fund notes in a press release: “Because of the tough economy in the last decade, earlier gains in fighting child poverty during the 1990s have been wiped out.” Despite our losses, other states have fallen even further behind. Minnesota’s poverty rate is higher than a dozen or so other states, but our ranking on the overall index of child well-being is still second only to New Hampshire. We have made tremendous progress in child well-being and reduced some of the most egregious disparities associated with differences in income and wealth, and race and ethnicity. At the same time, some of those hard-won gains are slipping away. We are at risk of losing the energy and effort that is fed by a realistic prospect of doing better than one’s parents, of moving up the economic ladder. Our children lag behind those of other countries in math and science preparation and college graduation. Our teen pregnancy rate, though improved, is still the highest in the developed world. Far too many of our children are unprepared to compete effectively in an increasingly technology- driven, high-skill global marketplace. We can—and must—do better. With sound investments, we can provide all children with the opportunity to reach the full potential of their talents and ambitions, while setting the nation on a path to renewed economic prosperity. It won’t be easy, but as a nation, we have the knowledge, tools, and determination to make it happen.